With snows beginning to fall in the Sierra, I was looking for something interesting to do in the desert, even if it was a little early to start doing hikes there in early November. 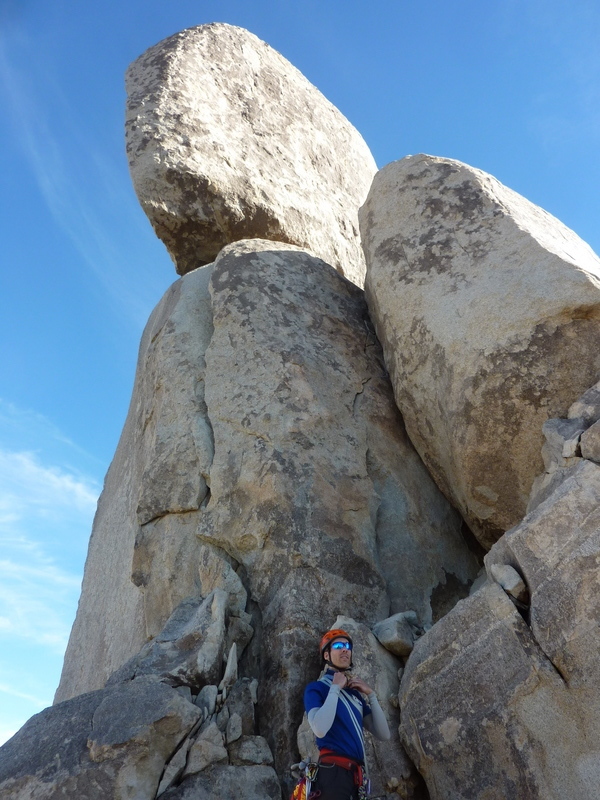 I began to think more about Old Woman Statue, a difficult rock climb in a remote part of the Mojave Desert. In his book Rambles & Scrambles, Purcell describes it as the hardest route included in the book - no small boast, considering there are more than 950 summits contained therein. Zdon give mention of it in his book, but offers no real climbing beta other than to say it is a mid-to-upper class 5 rock climb. There is a SummitPost page put up by Dave Daley that does a decent job describing the crack/chimney at the base and the 12-bolt ladder at the top. He rates the crack as 5.7 whereas Purcell gives it a 5.8, so I suspected it might be out of my league. With Scott and Iris signed up to join us, I wouldn't have to lead it. Of more concern was the bolt ladder, described by multiple folks who've done it as having dangerously old bolts that should not be depended on. This was going to be the crux of the matter and it seemed prudent to come prepared. To that end, I brought etriers (looped webbing steps for climbing bolt ladders), smaller ropes we might toss over the summit block to then haul up the climbing rope (this turned out to be impractical since the block was much too high), prussiks and an ascender. Scott brought the regular climbing gear to go with a 60m/9.5mm rope I'd brought. With all of this gear, four of us set out in Matt's Subaru from Essex, heading south on a series of moderate dirt roads that would take us some 20mi into the heart of the Old Woman Mountains. Old Woman Statue comes into view while still some miles away, and with a little imagination one can see how the name was derived. We passed a windmill spinning idly in the breeze next to a corral and a water storage tank. The windmill's gear has been replaced by a diesel generator though it wasn't currently operating. We wondered allowed why people continue to graze cattle out here. What we didn't expect to find was the newly developed Old Woman Mountains Preserve, a 2,560-acre parcel purchased by the Native American Land Conservancy (in large measure supported by the Spotlight 29 Casino, a tribal enterprise of the Twenty-Nine Palms Band of Mission Indians). The neat signs, informational plaques, OHV fencing and other new-ish features looked out of place in the remote desert landscape near Painted Rock. A gate here keeps OHV traffic away from Painted Rock. Another gate at the same location kept us from driving the rest of the way up the dirt road to the Old Woman TH described on SummitPost. This would make the outing a little more than 3.5mi each way - a remote summit grows a little more remote. We parked here and started out around 7:50a, taking about half an hour to cover the distance to the end of the road and the old TH marked by another windmill. From here the route goes cross-country to the northwest to the mouth of a small canyon that is climbed west to a ridge. From a saddle, Old Woman can be seen for the second time, now across a larger canyon draining to the south. It looked a bit too deep to head directly to Old Woman Statue, so we followed the ridgeline in an arc towards the north. There is a higher point, Peak 5,164ft, with more than 500ft of prominence a short distance north of Old Woman Statue that we bypassed on its east side across a jumble of boulders. We had thought this would make for an easy bonus peak but found it to be a very difficult-looking pinnacle that without a bolt ladder would be harder than even Old Woman Statue. We left this unexplored and never got very close, but it would be interesting to find out more about this objective. Following a surprising amount of scrambling in the last hundred yards, Scott and I reached the base of the climb by 10a. Iris and Matt were only a few minutes behind and we soon had our entire party at the base. The crack looked much like the pictures we'd seen, and above that, the first bolts of the ladder could be seen on the summit block - so far, all was pretty much as expected. I flaked out the rope while Matt took up filming duties on a convenient rock off to one side, Scott racking gear for the lead and Iris taking up belay duties. It was almost like we knew what we were doing. A flake on the left side of the crack/chimney runs 2/3 of the way up and greatly aided in getting past the awkward lower part of the crack. We would use this to pull up on, lieback, and stand on at various locations. Scott took about 15min to make his way up the thing, only really struggling at the very end where a mantling move is necessary to exit the crack. After setting up a belay on a convenient pair of bolts low on the summit block, Iris went up second to clean the gear, showing such poise and skill as to make it look rather mundane - and she was shouldering my pack, to boot. On his turn, Matt slipped off the flake at one point (held nicely by his belayer above) to provide some excitement before finishing up the pitch. Going last, I knew I hadn't the flexibility the others displayed in stemming, so after repeating the moves to climb the flake I stuck to the chimney and worked my way up without having to resort to such acrobatics. An hour had passed in getting four of us up that first pitch. The aid pitch went much smoother than I expected. On his first aid pitch ever, Scott showed impressive style, handling the etriers like he'd done this a dozen times - clip one into a bolt, climb the steps, clip second into next bolt, switch feet to higher etrier, climb, repeat. All the while he left biners and runners on each bolt to which he fastened the climbing rope that Iris fed out. By the third bolt he was high enough that he would get away with only minor injuries should the weighted one blow out. There were ocassional 3/8" stainless bolts to improve confidence and he even managed to skip one of the poorer bolts around the halfway point. He took only half an hour to climb to the top and set up an anchor - impressive indeed. While he had been working his way up, I was giving a hasty prussiking lesson to Matt who'd never practiced this bit of rockcraft. Iris was sort of half-listening, maybe because she already knew how to do it, but it seemed more likely because it looked unnecessary to her. When her turn came next, her first impulse was to free it, because well, that's what you're supposed to do. Matt and I looked at her like she was either crazy or Spiderwoman. She seemed to think she could free it but I thought it well beyond 5.10. Maybe there were skills infused in this woman I wasn't yet aware of. When she stood up and put her hands on the rock she had a sudden awareness of the difficulty that she had not reckoned with from her earlier belay position againt the rockface. Not being able to make the initial move off the ground, I suggested she should try aiding off the runners hanging from the bolts - at least that way she could claim a free "french" ascent. In this manner she made it up to the second and third bolts, a valiant effort, but all for naught - she couldn't reach the next piece and still found no way to actually climb the rock. Down she came. We handed her the prussiks and after more quick instruction and help getting her feet in the stirrups, she went up, slowly but steadily. By 12:30p she had joined Scott and half an hour later so did Matt. I was somewhat faster than either for two reasons - one, I had done this before and knew some of the nuances of climbing a rope via aid. Secondly, and perhaps more importantly, I remembered I had an ascender in my pack and dug it out, fixing to the cord connected to the leg loops. This removed the troublesome part of trying to move the leg loops up via prussik, the ascender sliding up the rope much more effortlessly. It was almost 1:15p by the time we had all four of us at the summit. I found Scott and Iris barefoot, their climbing shoes causing too much pain to leave them on for such a long period. I photographed the 14 pages of a register Greg Vernon had left in 2000, snapped a few other photos and then went about setting up for the rappel.